Through this post office themed lesson plan, kids will learn and practice the letters of the alphabet. 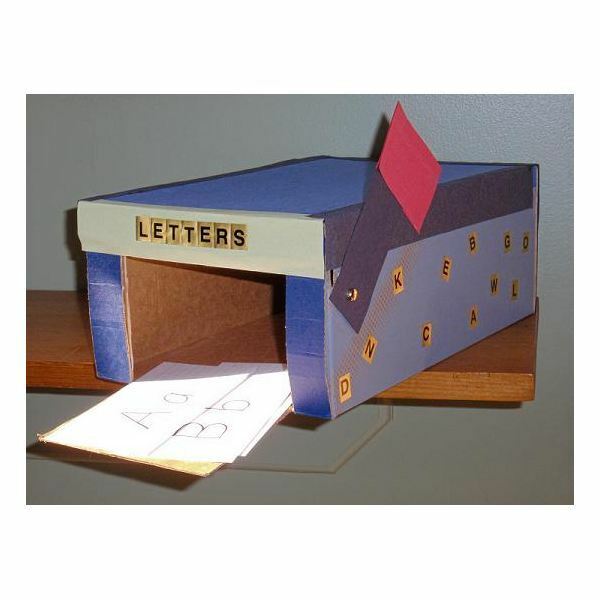 Included in this article are instructions on how to teach letter recognition through an arts and crafts mailbox project, a ‘letter’ postcard activity, and an action game called Hidden Letters. Children will enjoy the process, and more importantly, they will be learning while having fun. The materials provided in this article can be altered or built on for use with teaching other basic language principles, such as letter sounds or words that rhyme. It also lends itself to taking a short class trip to the local post office. Use a razor blade or sharp scissors to cut a rectangular flap in one end of each shoe box. Leave the bottom section of the flap uncut. This serves as the mailbox door. 1. Give each child a shoebox mailbox to decorate. Encourage them to cut shapes or strips out and glue them to the mailbox. 2. Provide the children with ‘letter’ stickers to add to the mailbox. Also, allow them to draw on their mailboxes. The idea is for each child to create a personalized mailbox. 3. Place the kids’ mailboxes on the corner of their desks or in another predetermined location. Be sure to have each child include his or her name somewhere on the mailbox. Ahead of time, print the upper case and lower case form of each letter on the lined side of the index cards. Create a separate postcard for each letter. Leave the backside of each card blank. You may choose to create an entire set of the alphabet for students or concentrate on a few letters. Each day, go over a different ‘letter’ postcard with the children. Discuss the name of the letter and the sounds it makes. Have them flip the card over to the blank side and draw a picture of something which begins with the letter. Then, provide the kids with a small square sticker to serve as a stamp. Let them place their ‘stamps’ in the upper right-hand corner of the postcard and then mail it in their own mailboxes. The mailbox will serve as a holding place for all of the child’s ‘letter’ postcards. Hidden Letters is a game to play with preschool children to help them practice spelling their names and continuing to practice letter recognition. Use index cards to create letter cards for this game. To do so, simply print one letter of the alphabet on each card. Include multiple cards of each letter, especially those which are commonly used. Be sure to make at least as many letters as the children have in their names. Hide the letter cards throughout the room before the children arrive. Provide each child with an empty envelope and a name card which shows how to correctly spell his or her name. Then, ask the kids to search the room for the letters. Have them place only the ones needed to spell out their names inside their envelope. Allow the children to keep the envelope of letters for future practice with spelling their names. These letters may also be placed in the mailbox for safe keeping. Gather the students into a group circle and ask them basic questions about letters. Hold up a letter card and have the students call out the correct letter name or sound. Are they able to properly identify the letters? Can they provide examples of words beginning with the letter sounds? The mailbox and ‘letter’ postcards created during this post office themed lesson may also be used to teach preschool children other language principles. Encourage the children and their parents to hold onto these materials and continue to build on the basics presented in this lesson plan. Bright Hub’s Early Childhood Education and Preschool Channel also provides more information on how to teach letter sounds to preschoolers and teaching letter recognition.